It’s a rainy Saturday and the big boys are engrossed in a lego marathon. The toddlers are listless. Sebastian heads for the craft box. My heart sinks. 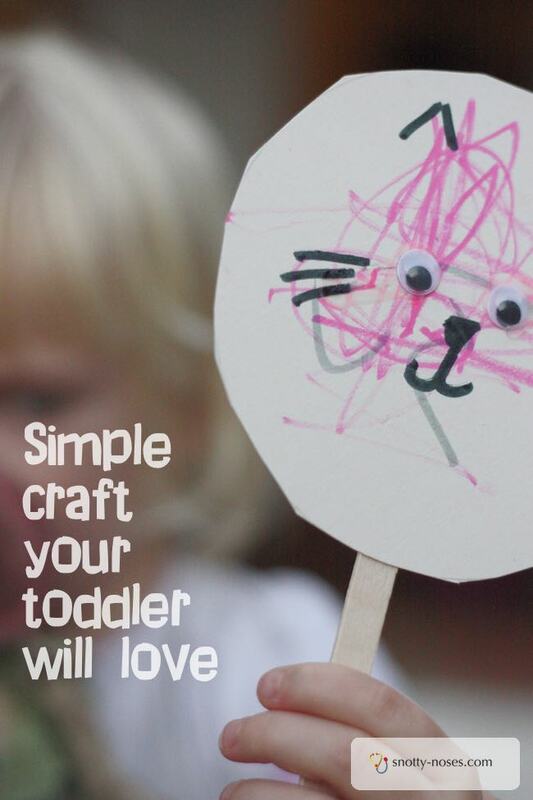 Toddlers and crafts just seem impossible, everything is too complicated. “Doggy!” he yells. He wants me to make a balloon doggy. I pause. The stirring of an idea. 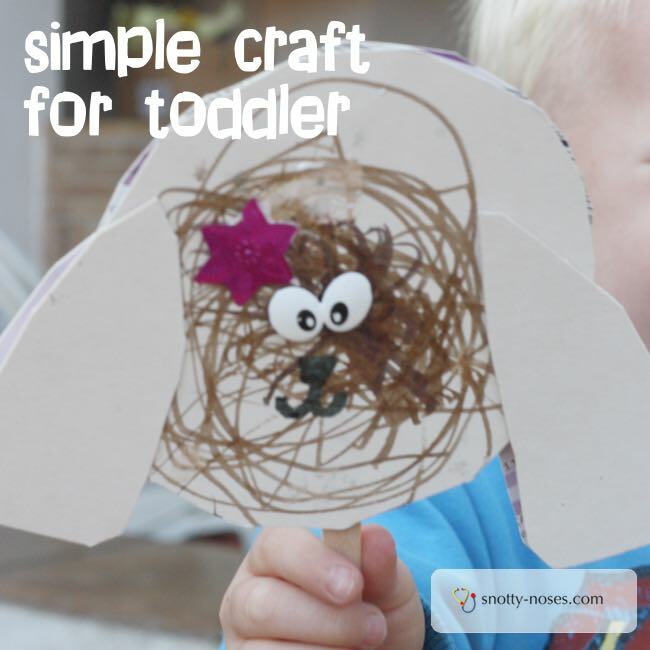 A really easy craft for toddlers. I’ll confess, there was a little bit of inspiration. Dante had made a sheep on a stick at school. One of the goggly eyes fell off so I stuck it back on. That’s when the idea struck me. I could adapt the sheep for the toddlers. This is a craft idea that is so easy you can do it at home with whatever you have on hand. Any old cardboard will do and if you don’t have goggly eyes, just draw them on. What you need for this easy craft. Goggly eyes (don’t worry if you don’t have any). Something round to draw around. I used an old lid from a tub of soft cheese. How to make your really easy craft. Cut open the cereal packet and draw around the lid. Let them colour in the circles. Add any mouth or features that you like. Stick the lolly stick on the back. Add a back if you like. We made a doggy. Yes! It is a doggy, can’t you tell? And a frog who is blue and yellow. I left all the things out for a while (read, hadn’t got around to tidying up) and along came Dante who wanted to make a monster. When Celeste woke up, she made a cat. It’s 2 days later and Sebastian is still carrying around his doggy. How much entertainment is that from some old cereal packets and some lolly sticks?